Bolshoi Theatre is one of the most recognised and well known landmarks in Moscow. It is located on Teatralnaya Square in the very center of the city near Teatralnaya metro station. 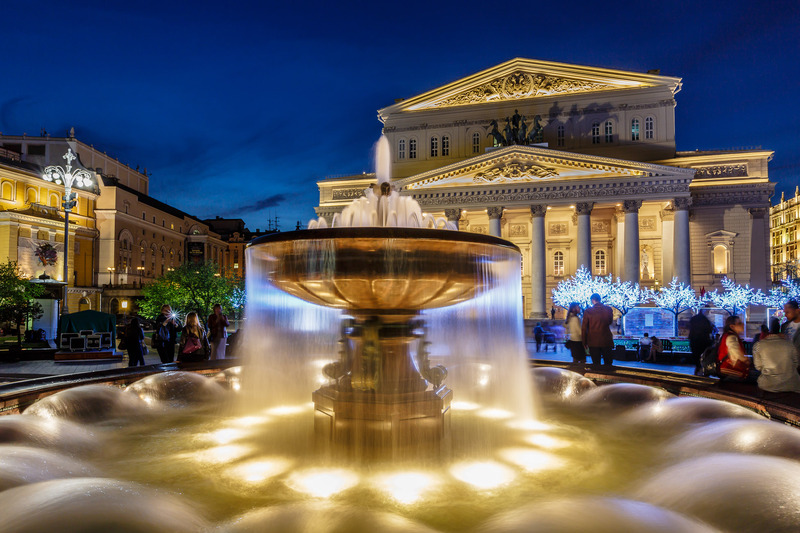 The square in front of Bolshoi Theatre is charming and relaxing and big round fountain in the centre beautifully illuminated in the evening. Usually there are a lot of people around this fountain – both tourists and locals. One spring evening I went here to shoot a timelapse video of Bolshoi Theatre with many people bustling in front of it. When timelapse shoot was over and it became rather dark I suddenly realised that illuminated fountain in foreground and Bolshoi Theatre in background make a very good composition. So I quickly assembled my tripod again and used the last blue hour minutes to compose and capture this photo! Single exposure, focal length 22mm, aperture f/11, shutter speed 3.2 second, ISO 100, tripod.